It’s already a few days into the New Year and the air has already changed! Maybe because the temperature, which reached record-high heat the past few weeks, has now cooled. But really it’s the change of pace from a busy Holiday season to an abrupt, celebratory end on New Years day. January is cold. The temperature, the atmosphere. To me, it is the real beginning of winter. The lull between festivities and spring cheer. But, this month, too harbors a feeling of new beginnings. Even if you are not big on New Year’s resolutions, January is an open book. There's no pressure, but just time to take a breather from fast-moving pace of late fall. It’s a slower month, at least to me —maybe because cold air actually slows down molecular processes — but it can nonetheless be a productive month — to embrace your inner introvert and take the time to reflect, imagine, and create! Because we are also in the month of resolutions and a new attitude towards health and self-improvement, I decided to make one of my favorite healthy winter salad: Bright Cranberry Mint Quinoa Salad! 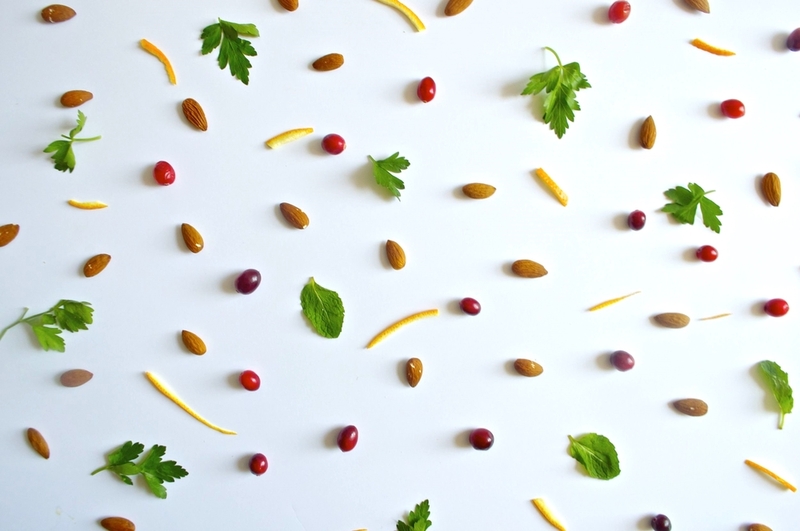 This Quinoa salad has everything you want in a salad — bright tangy flavors from the cranberry and orange slices, fresh aromatic herbs like mint and parsley to liven up the dish, almonds for crunch and nuttiness, and of course the quinoa, which I stew with the raw cranberries and some orange peel. By cooking the cranberries with the quinoa, not only does it cook them, but it allows the grain to absorb the juices and fresh, bright taste. This dish is packed with protein from the quinoa and almonds, Vitamin C and antioxidants from the cranberries and oranges, and anti-inflammatory properties from the fresh herbs. I really love this salad, because it’s super versatile. You could have it as is, in a bowl — warm or cold, you could add seasonal fruits or vegetables like apples, celery, pomegranates etc., or you could top it with some Greek yogurt or Labneh yogurt. The other night, I had a little quinoa left over so I just dolloped it on top of a mixed salad and boy, did it amp up the greens! I’m always a fan of mixing ingredients and dishes — the more colors on your plate, the better! What really makes this salad winter-y and wonderfully delicious is the cranberries that are cooked with the quinoa. It’s important to use fresh cranberries. Dried cranberries are usually packed with sugar and don’t provide as much flavor. The quinoa will turn a rich, deep red color and perfume aromas of tart cranberries. Because I use orange segments in this dish, I like to add the orange peel directly into the quinoa when cooking it to help elevate the citrus flavors. For the dressing, I use a simple lemon-mint vinaigrette: Lemon, maple syrup, mint, olive oil, and salt and pepper. To make vegan, use maple syrup or agave instead. Just be sure to add the salt before you drizzle in the olive oil, that way it can emulsify and better incorporate into the mixture. When I’m feeling lazy, and I did this particular day, I just shake the vinaigrette ingredients together in a jar. Just make sure to gradually add the olive oil. Tasting is key. If you like a sweeter vinaigrette, then by all means add more maple syrup (or another sweetener). If you prefer a more acidic dressing, add a dash of white wine vinegar or more lemon juice. It’s all up to you. You are the taste tester — so taste as you go! This Cranberry Mint Quinoa Salad is bright, healthy, and hearty and sure to make you feel good on a cold winter day. Make it on Sunday and have lunch all week long. Make it as your main course or just as a friendly side dish. A snack in the fridge will do just as well. As the juices settle, the quinoa develops richer flavor. So letting the salad rest overnight has its benefits. Just be sure to add fresh herbs when you serve, you’ll be able to taste the difference. I hope you enjoy this recipe as much as I do! Happy 2016! 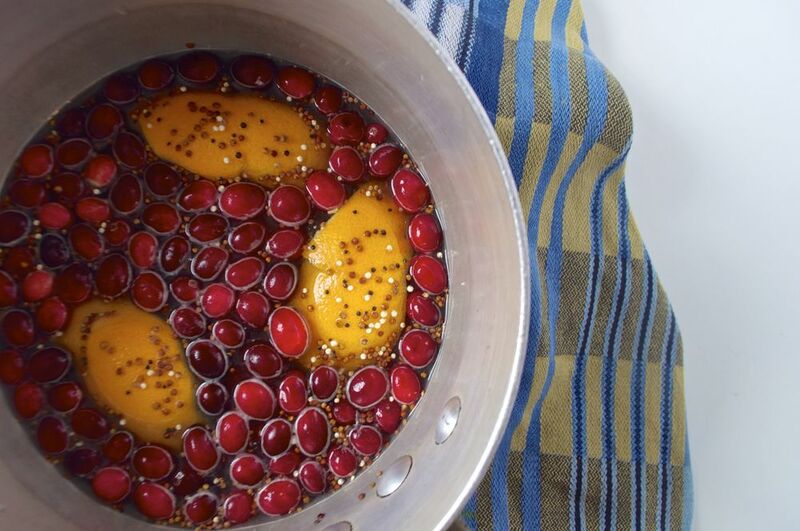 In a sauce pan, add the quinoa, cranberries, peel of 1/2 an orange, and water and bring to a boil. Reduce to low, cover, and let simmer until the liquid has been absorbed and the quinoa is tender but still a little firm, about 15-20 minutes. Turn off heat and let sit with the cover for about 5 minutes. Remove the orange peel and fluff with a fork. Let cool at temperature or in the fridge. In a jar or bowl, add the lemon, maple syrup, and salt. Whisk (or shake) until thoroughly combined. Gradually add the extra virgin olive oil and continue to whisk until thoroughly incorporated. Season with black pepper and mint leaves. Taste as you go. Add more / less depending on your taste. To assemble the salad, cut the orange into segments and halve for a smaller bite. In a bowl, add the cooled quinoa, orange segments, almonds, mint, and parsley. Toss with the vinaigrette and garnish with some fresh mint. Serve and enjoy!